Treasury Secretary Steven Mnuchin argued on Fox News Sunday for a “clean” hike in the debt limit. Mnuchin also pushed a strategy of attaching the debt limit as an amendment to a bill to provide $7.9 billion in temporary relief to victims of Hurricane Harvey. Other reports indicate the legislative strategy is for the House to send over a Hurricane Harvey relief package to the Senate, then for the Senate to attach a debt limit hike and send right back to the House. Yet again, the Republican establishment controlled leadership is bending over backward to avoid spending cuts. They are loath to cut spending in a way that would anger their pals in the media and would cause a fight with Democrats. Mnuchin and Republicans in leadership in the House and Senate are attempting to take this hurricane aid package hostage to carry a debt limit hike across the finish line. These are the same tactics that conservatives complained of during the Obama-Reid-Pelosi reign of progressive legislative terror. It is time for Republicans to act like Republicans again. Back in 2011, these same Republicans fought for deep cuts to spending to be attached to any hike in the debt limit. The fight started as something called “Cut, Cap and Balance” and resulted in a sequester of cuts to discretionary programs. Yet now, when Republicans have a power, they seem reluctant to use the majorities they have in the House and Senate to fight out of control government spending. Much like many voters feel lied to by the empty Republican promise of “Obamacare repeal,” we are now seeing the same scenario play out on a debt limit hike. Republicans were willing to fight when they were largely out of power in 2011, but not now that they have control of the House, Senate, and White House, they are not willing to fight. 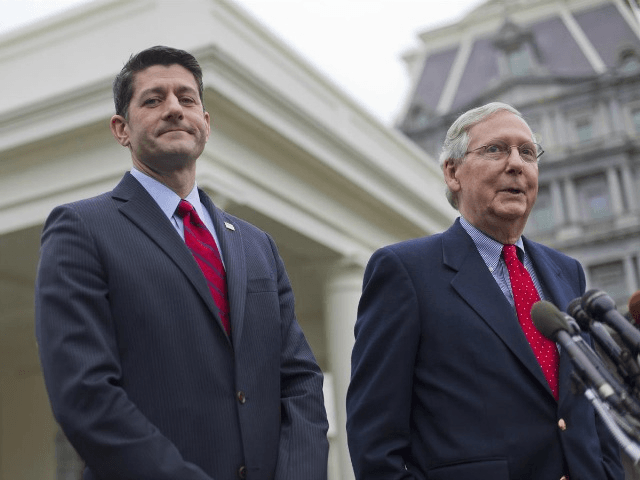 This year has been a series of ugly legislative train wrecks that have resulted in zero significant accomplishments for Speaker of the House Paul Ryan (R-WI) and Senate Majority Leader Mitch McConnell (R-KY). Now is the time to put some points on the board and to use that majority to do some good. Congress should consider the president’s request for $7.9 billion in aid separately from the debt limit hike. This would provide the Congress an opportunity to debate and process spending reforms as part of any bill to hike the spending authority of our federal government. A federal government that has spent us into $20 trillion in national debt is in need of reform and cuts. Balance – Congressional passage of a Balanced Budget Amendment to the U.S. Constitution – but only if it includes both a spending limitation and super-majority for raising taxes, in addition to balancing revenues and expenditures. Reuters reported a few months ago that Rep. Mark Meadows, the Chairman of the House Freedom Caucus, has pledged to push for reforms and cuts as part of any bill to hike the debt limit. On March 16, 2012, Sens. Jim DeMint (R-SC), Rand Paul (R-KY), Mike Lee (R-UT), Ron Johnson (R-WI), and Marco Rubio (R-FL) co-authored an Op-Ed for Politico where they argued “we called on Congress to cut unnecessary, and unconstitutional, spending immediately, cap future spending in line with average historical revenues and send a balanced budget constitutional amendment to the states for ratification. As Congress begins a new budget season, we stand by that call.” Those Senators can team up with the House Freedom Caucus to lead the fight on using the debt limit for spending reforms. Sen. Jim DeMint has started a new organization, the Conservative Partnership Institute (CPI), and can help from the outside to push a new Cut, Cap, and Balance bill. An excellent roadmap to a new Cut, Cap and Balance is the bill Sen. Paul introduced in 2015. Paul proposed $207 billion in cuts and exempted Social Security, Medicare, Military pay, veteran benefits, and interest. The Cut, Cap and Balance Act of 2015 also set up cuts that resulted in a pathway to capped spending at 18% of Gross Domestic Product (GDP) in 5 years. The final provision was to prevent any future debt limit hike until Congress passes a balanced budget amendment passed and sent to the states for ratification. Senator Paul’s bill also put forth a version of the Default Protection Act that would prioritize the debt going forward if the federal government decides to stop increasing federal borrowing authority. The bill gives debt service, military pay, Social Security, and Medicare payments priority over other spending as revenues are collected. The American people didn’t give Republicans control of the House, Senate, and the presidency just so they could talk big and produce nothing. The time is now for a new Cut, Cap, and Balance that will keep the promise of spending cuts that Republicans have promised my whole lifetime.